Wouldn’t it be nice to talk to others about Cryptocurrencies? Talk about how they are handling the latest price dip? To seek their advice? To take suggestions? To find help? This is exactly the basic concept behind our Bitcoin India Forum. 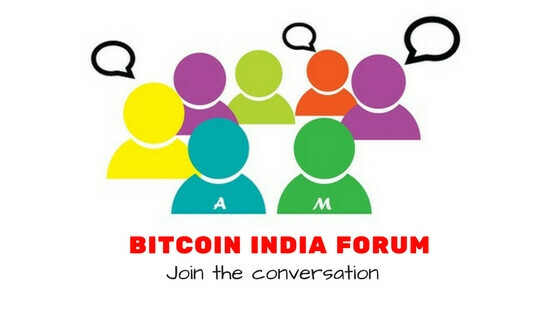 As #1 Bitcoin India Blog that thousands of people trust and rely on, we bring you India’s first dedicated forum for all the cryptocurrency enthusiasts, traders, and investors. Given a comparatively new niche, a lot of confusions exist on the scene. Be it exactly how to buy Bitcoin, which is the best exchange to buy the cryptocurrency or how to fight back panic selling. And of course, not to forget the occasional rumors that Bitcoin is illegal in India now. Also, when the price rises and dips, knowing when to buy and sell is equally important to maximize the returns. Getting on-time advice and insights from someone more experienced is as handy as it gets. This is what this Bitcoin India Forum strives to achieve. To create a community who shares, learns and grows together. Admittedly, there exist a handful of open platforms to discuss Cryptocurrencies. However, ours is unique in a way that it targets Indians, specifically, from every corner, ensuring language is no barrier. We encourage multi-lingual engagement so that everyone is a part of the bigger conversation, which isn’t facilitated and encouraged on various other forums. So it’s okay if you’re weak in English. You can talk in your native language openly without the ball hanging over your head of getting banned from the forum or being laughed at by others. Bitcoin, and cryptocurrency at large, has a long way to go in India. While the number of investors has increased, the majority still needs to be educated about it. And what better way to do that than on a single platform that promotes easy communication, knowledge sharing, and personalized advice?! Be an early adopter. Be a part of the forum. Start a conversation. Be a part of others’ conversation. Let’s create something awesome. Go To Bitcoin India Forum.